Do you know what’s common with the clap of your hands, the stomping of your feet, and even the ringtone you hear every day on your phone? They’re all percussion instruments! What makes percussion interesting is how you can come across its sound anywhere, anytime without you even noticing. The sound of percussion can be made by any object being hit with an implement, shaken, rubbed, scraped, or by any other action which sets the object into vibration. Percussion instruments are also known as one of the very first instruments ever discovered, and that they have spirit as they are made of once living things that gave their life to become part of the instrument. 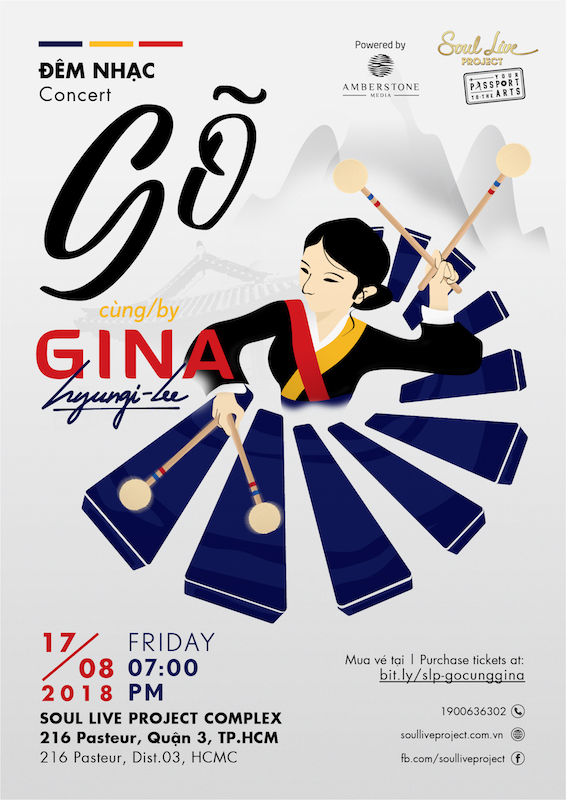 At the percussion concert, “GÕ!”, with the repertoire put together by Percussionist Gina Hyungi Lee and Soul Live Project’s Artistic Director for Classical Music – Tra Nguyen Pianist, the audience will experience the beauty of melody and hear the tiniest delicacy in the rhythm of different percussion instruments. The two main instruments that will be presented are the marimba and snare drum. . Gina will be performing a various repertoire, from the world-famous pieces by Bach and Piazolla, and the contemporary pieces that has been written in the last 20 years, to Korean traditional music, and well known Vietnamese pieces especially for the audience in Ho Chi Minh City in her very first concert here. In addition, Gina will introduce to the audience interesting performances of “body percussion” – creating rhythm with body parts, and “junk percussion” – with the “from-the-kitchen” set of instruments. The sound and rhythm created by the things that are close to our daily lives will definitely leave the audience in awe! With impressive performances featuring different percussion instruments on various Vietnamese, Korean and world-famous music pieces, this not-to-be-missed concert will become a lovely space for exchanging cultures through the performing arts. Let’s come, experience, and make beautiful sound together! Gina Hyungi Lee, born in 1996 in South Korea, is a rising star on the solo percussion scene. She held a Government Scholarship under the Music and Dance Scheme when she studied at The Purcell School of Music in England. After graduating from The Purcell School, she went on to study solo Marimba with Daniella Ganeva and orchestral percussion with David Hockings. Gina was awarded First Prize at the Seoul University National Competition, the Guildhall and Trinity Hall Marimba Competition and the Fermo International Percussion Competition in Italy at the age of 13. She reached the semi-finals of the 2012 BBC Young Musician of the Year Competition and was awarded the Walter Todd Bursary for the most promising young performer. She was awarded an ABRSM scholarship from the Royal College of Music. She has performed at various concert venues including Wigmore Hall, Cadogan Hall, Elgar room in Royal Albert Hall and Royal Opera House. Gina is also an award-winning artist that has been honoured in different competitions worldwide. She won first prize in the International Marimba Congress and Competition 2014 held in Germany. And she came in 3rd in the 6th Edizione Concorso Musicale Europeo that was held in Italy. And more recently, she twice won the Royal College of Music’s Percussion Competition in 2016 and 2017. About Soul Live Project’s Artistic Director for Classical Music: Tra Nguyen – Pianist. British-Vietnamese pianist Tra Nguyen’s performances have been praised as “coruscating” (The Independent), “sophisticated” (Rheinpfalz-Zeitung) and possesses “surpassing” keyboard artistry and passion (American Record Guide). Tra Nguyen has been awarded the ARAM (Associate of the Royal Academy of Music) for her “significant contribution to the music profession” in May 2013. She gave her first performance at the Hanoi Opera House when she was ten and has continued to engage audiences in other prestigious venues worldwide (Queen Elizabeth Hall, Wigmore Hall, the Kennedy Center and Tokyo Opera City amongst others). Her recent recordings on Sterling and Grand Piano Naxos were chosen twice as Album of the Week by The Independent, in March 2010 and April 2012.